This weekend there has been: ducks, egrets, hawks, and boring brown birds at Elkhorn Slough, dinner at the Shadowbrook (happy birthday to the Step-mom! ), a short hike in Big Basin which became a slightly longer (but very nice) 12 mile hike to a lovely waterfall, and many sightings of the California Newt. As a side note, I need shoe advice. I went hiking in a pair of addidas that gave me the worst water blisters on both my pinky toes. Does anyone have any advice on finding good hiking/walking shoes for those of us with slightly wide feet? It would be really nice to not have to cut off my pinky toes. Thanks. \n\n\nThis weekend there has been: ducks, egrets, hawks, and boring brown birds at Elkhorn Slough, dinner at the Shadowbrook (happy birthday to the Step-mom! 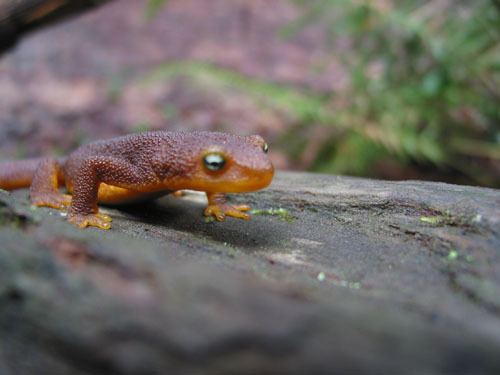 ), a short hike in Big Basin which became a slightly longer (but very nice) 12 mile hike to a lovely waterfall, and many sightings of the California Newt.\n\nAs a side note, I need shoe advice. I went hiking in a pair of addidas that gave me the worst water blisters on both my pinky toes. Does anyone have any advice on finding good hiking/walking shoes for those of us with slightly wide feet? It would be really nice to not have to cut off my pinky toes. Thanks.